Fan controllers seem to be everywhere these days, and for good reason... 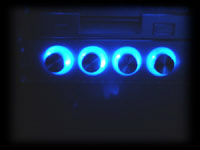 Maintaining safe operating temperatures inside your computer case, while minimizing noise outside your case, has become notably more important as the demands on systems has increased. One of the more stylish products available to handle this responsibility is the Noise Isolator 3.5” rheobus available from Jab-Tech for a mere $16.95 (visit the BigBruin.Com Forum to learn how to pay even less). Jab-Tech is a relatively new online source for ”overclocking, pc modding and case modding” supplies located in southern New York state. 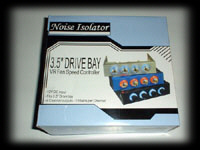 They carry a wide variety of products to keep your pc running smooth and looking cool, including the silver version of the Noise Isolator 3.5” rheobus provided for this review. 4The LED back light becomes brighter as the fan speed increases. In case you aren’t familiar with rheobuses, they are relatively simple devices that consist of an array of rheostats (a device that regulates current by varying the resistance) for control of electronic devices. Applied to fans in a computer, the result is speed control, which in turn also manipulates the noise output. The Noise Isolator 3.5” rheobus, as the name implies is designed for use in an available 3.5” drive bay and consists of four rheostats. With a power rating of 13 watts per channel, you may not be limited to controlling just 4 fans, but if more than one fan is added to each channel please make note that the total demand of the fans doesn’t exceed the 13 watt rating. 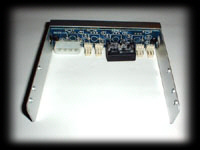 The Noise Isolator rheobus arrived from Jab-Tech in the box pictured in the above left image. 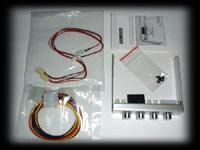 The contents of the box are pictured in the above middle image, and include the following (listed clockwise from the upper left-hand corner): 1) two 3-pin extension wires, 2) concise users guide, 3) a pack of four mounting screws, 4) the rheobus, and 5) a 4-pin Y adaptor for receiving power. The above right image shows an item not included with the rheobus, but a cheap adder that I would highly recommend. 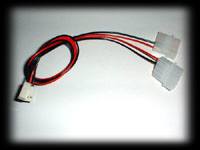 Pictured are two 4-pin to 3-pin extension wires that will make adding 4-pin fans to your rheobus a snap, and will only set you back an extra $1.49 each. The three images above provide our first look at the rheobus from various angles. 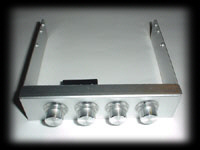 The compact unit comes with an attractive brushed aluminum finish that features 4 matching metallic knobs with small notches for use as an indicator. 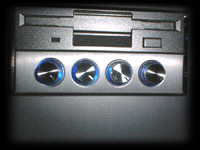 The base of each knob has a clear acrylic ring where the blue backlighting will shine through when powered up. 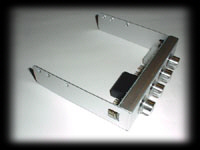 The side of the rheobus features threaded holes for mounting the device to a 3.5” drive using the included screws. The back of the rheobus features the controls and electrical connection, and as you can see from the picture, the layout is very clean simple. 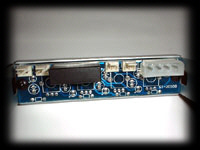 The two images above provide a closer look at the front and back of the rheobus. 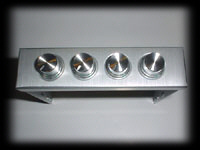 I was impressed with the finish on the front of the unit, and in particular, the finish on the four knobs. I have another silver 3.5” rheobus (from a different store and manufacturer) and one of my two complaints with that other unit was the shoddy finish on the knobs... which I will detail later. Once the unit was given a quick once over outside my system, I installed it into an AMS gTower aluminum case, and connected it to a 120 mm exhaust fan, a 70 mm cpu cooler fan, and two 80 mm case fans for testing. I only have four fans in this case, so there was no need to double up on any of the rheobus’ four channels, and during testing, speed results were recorded from Motherboard Monitor on the 70 mm cpu cooler fan (the only one with a speed sensing lead). The two images above show the Noise Isolator rheobus installed into my aluminum case. The aluminum matches the finish of the case nicely, and even my Rustoleum painted silver floppy drive doesn’t look out of place next to it. 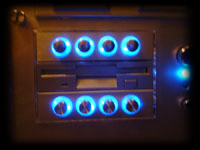 With the room lights dimmed and the rheobus powered up, you get the full effect of the blue backlighting, as pictured in the above right image. The intensity of the lighting does vary slightly as you adjust the fan speed, but it is so subtle that you really can’t use it as an indicator of where your fans might be set. The fan control is simple and effective. I was able to reduce the noise from my system dramatically by reducing the speed just a small percentage, while maintaining the same system temperatures present without fan speed control. The 70 mm cpu cooler fan has a maximum speed of 4025 RPM according to Motherboard Monitor. With the rheobus at its maximum speed setting, the display read 4017 RPM (approximately 100% of max), and at its minimum speed setting, the display read 2156 RPM (approximately 50% of max). The results at any speed but full speed fluctuated greatly on Motherboard Monitor, but it was obvious that a drastic reduction in speed was possible. As mentioned previously, the Noise Isolator unit was not my first 3.5” silver rheobus. 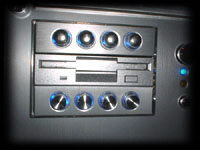 The two images above show the other 3.5” rheobus (as reviewed here, for example) installed above the unit provided by Jab-Tech. As you can see in the pictures, the lighting effect is nearly identical, but the finish on the Noise Isolator knobs is nicer than the other unit. It may only be an aesthetic issue, but it is still important to note. Beyond the superior appearance, the Noise Isolator 3.5” rheobus has another advantage over other 3.5” rheobuses on the market... A power rating of 13 Watts per channel, versus 8 Watts per channel. Factor in the price, and the advantage definitely goes to Noise Isolator. The Noise Isolator 3.5” rheobus is a very attractive option for those looking to take control of their case fans, and the associated noise. The device does exactly what it is supposed to, looks good doing it, and the Jab-Tech price tag is impressive, too. Installation can be completed in a relatively short period of time, and is made even easier thanks to the included hardware, especially the 3-pin power extension wires that you don’t see included with most rheobuses. The only complaint I have about this item is most definitely an isolated incident, and this is that one of the four knobs didn’t spin as freely as the rest. Not a big deal really, and nothing to get excited about. Special thanks to Jab-Tech for providing the Noise Isolator 3.5” rheobus for review!